…is at the heart of management, coaching, measurement, rewards, etc. Crisply defined and reinforced responsibilities increase focus, integration and performance. I cannot think of a more important layer to execution than making sure everyone knows who owns, who is supposed to do, who needs to review before an action, and those who need to be communicated to about the results. If you have any belief in meritocracy, this post is for you. …is part of the 5 W’s (and one H). Typically the first element everyone wants to talk about and one of the most important. However, before addressing WHO, we should spend a little time talking about responsibilities in general and WHAT-and-HOW. For simplicity, let’s agree to reduce the WHAT-and-HOW discussion down to three types of WHAT-and-HOW actions. If we did this right, we have a mutually exclusive and comprehensively exhaustive (MECE) set of activities representing most of the work activity occurring in most businesses. Said another way, WHAT-and-HOW can be thought of as one of three actions: Project Task, Process Step or Decision. Now we can begin our discussion of the WHO with a similar effort. I believe for any of the three WHAT-and-HOW actions, there are just four generic roles an individual, group, company, etc. can play. 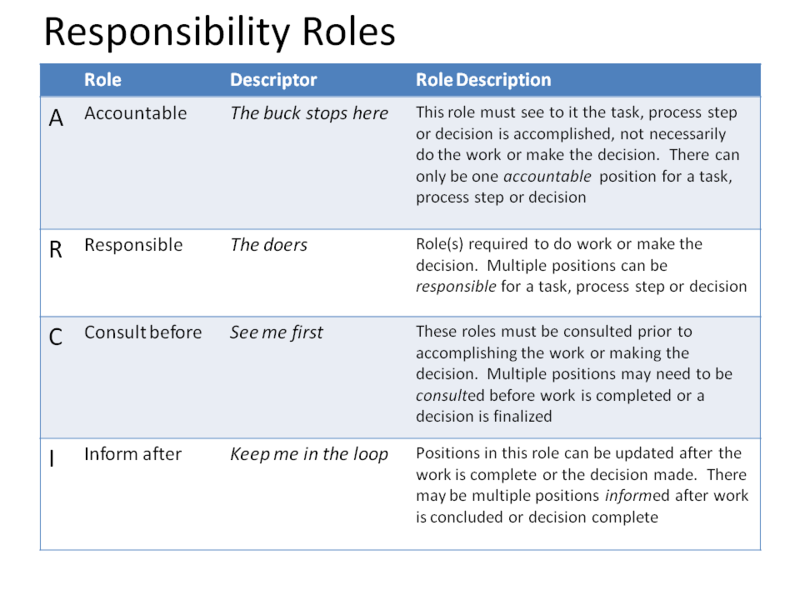 These responsibility roles are broadly referred to as RACI or ARCI- Accountable, Responsible, Consult and Inform. Broadly enough it seems, I have not been able to find attribution for the mental model. 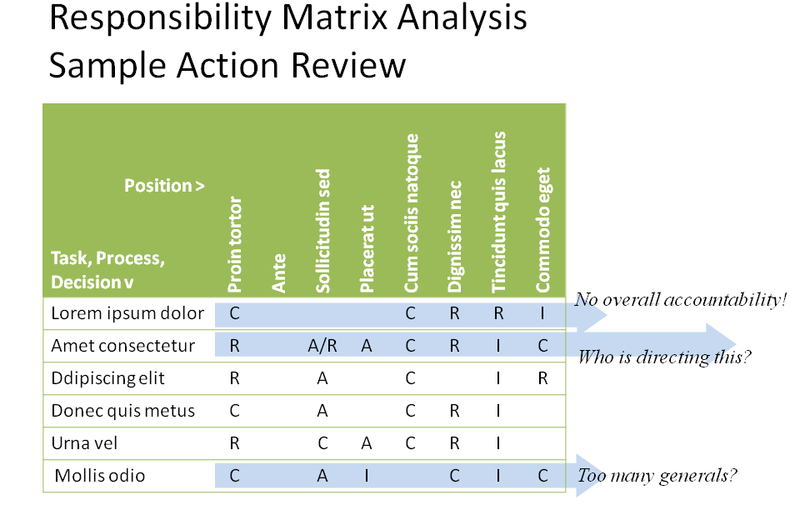 I believe in the ARCI form, as it places the singular accountability as the first-letter of the acronym. What follows is a the definition for ARCI I have used since 1997. Since we now know not all who’s are created equal. For each project, process or decision map we can define and analyze roles of positions and the activity applied to each. Task, process and decision analysis As you build a list of the project, process or decision actions in rows, you can also think of all the stakeholders. 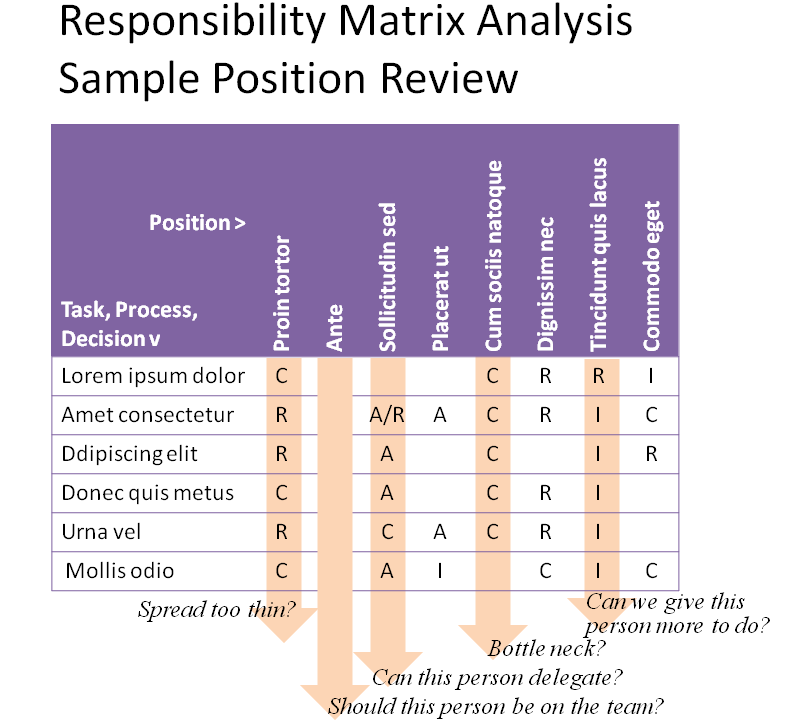 By adding a column for each relevant stakeholder, you create a responsibility matrix with each action-position cell able to be described by a generic ARCI role, if any, for the position. Formalizing responsibilities for projects, processes and decisions by this proven technique can bring you immediate and long-term impact. I worked with several models for too many years, resulting in fuzzily defined roles. When introduced to this simple framework, I found it intuitive and simple to explain to all levels of management and staff. 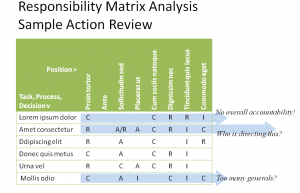 I believe you will find the crystal-clear role clarity these 4 generic roles (Accountable, Responsible, Consult and Inform) can bring will be extremely useful. I believe when you couple the role definitions with the necessary work to affect buy-in by the people in the positions, you will really add some energy to your actions. Many clients I have worked with, and organizations I have run, almost immediately adopt the “I have the ‘A’ “ culture.